"The early summer sky was the color of cat vomit." "The old bridge stretched massively across the water, it huge iron frame as black as the sky. It had been built so long ago that it held up its own weight, without any support from hoverstruts. A million years from now, when the rest of the city had crumbled, the bridge would probably remain like a fossilized bone." 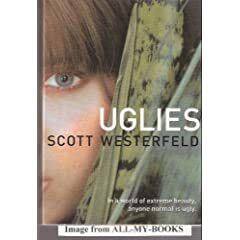 I did have to take time to mold Westerfeld's world into my brain. So, I can understand why I've heard that a reader couldn't get into this book. It might not be for everyone. I think it would make for a great discussion. For me, I like that part of setting things up in my brain then seeing how it unfolds as the story goes. yeay! I'm glad you loved it! I meant to read the sequels right away and still haven't made it there...ah, if only there was more time to read all the great books out there! Yay! I was so happy to hear you liked the book, Julie. Can't wait to see your thoughts on Pretties, which is my favorite book in the series (despite the annoying pretty-language). Oh, thanks Rebecca and I understand so much about not having enough time to read all the great books! The first one was my favorite in this series. He really does have a way doesn't he, likes making a statement. Glad you liked it! Great review! I did really like this one and it will be interesting to see which I like best after I've read the series. You're right, Lula, he does have a way with his writing.